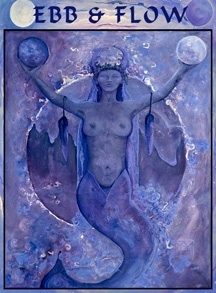 The medicine in this painting is of the Earth as well as the oceans for “Earth Mother of the Oceans” is grounded in Earth as she is a Pagan Celt. Due to persecution and conditioned fear, it is necessary I feel to define what Pagans are not as well as what they are. Pagans are not sexual deviants, do not worship the devil, are not evil, do not practice 'black magic' and their practices do not involve harming people or animals, ever. Pagans do share an ecological vision that comes from love and devotion to the Mother Earth and the belief in the organic strength and spirituality of the natural world. Like indigenous tribes they hold precious all of life and see Spirit in all things. It is a 'Universal' based religion, believing in the seen and unseen forces in all of nature here on Earth and in the greater universe. Again like most indigenous tribes theirs is a rich and colorful oral tradition, kept alive by poets and storytellers. It is a religion of honor and respect for all living things. Earth Mother of the Oceans brings in magical powers of the stag. She assists in going into the depths in the oceans of emotions while remaining grounded and centered in doing so. Her ability to shift into other dimensions and or levels of consciousness is brought through the medicine of the stag, which for the Celts is always seen as a magical being who can lead one into other worlds, even the faerie realm. She often appears, as a beautiful woman who can shift her shape into a deer as She wishes. The antlers help connect her to the higher worlds like antennas, therefore one of the Goddesses qualities is to help shift the gears of an unpleasant situation into something more positive through the mastery of the mind. Mermaid of the ancients shares the birth in Her womb. This mermaid balances the scales of inner knowingness and matters of the Heart. Her essence is complete compassion and peace within the Masculine and the Feminine. She is the Goddess of the Mother Ocean, depicted here in her primordial aspect as the mermaid as well as the Moon Mother. “Earth Mother of the Oceans” is more how I remember the true mermaid to be. She is power supreme in authority; her skin is a grey-blue and tattooed. A Being of the water she holds both the full moon and the new moon and all the moons in-between. Her crown is of the earth as she wears the stag’s antlers for she has the ability to shape shift her fins, walk upon the earth, travel through the elder forests, and sing her songs to Mother Mu, the Earth and Her waters too. There she is when we flow within the tides rise and fall in the oceans full of emotions. The true gift of Ebb & Flow is gracefulness, imagine the movement of water through a river. Once we trust the river, these moving, living soul actions occur in seas of confidence and courage. Water freely shapes and reshapes to fit its urn, always maintaining a perfect fit. Waters integrity does not change, just its form, shape shifting from Amrita the nectar of the Goddess, a delicate snowflake into ice, hot steam, thunder clouds, cold rain or warm tears. We know this sacred substance that is so associated with the Divine Feminine brings blessings of curative healing and transformative powers. Sound travels through water faster than through air and is the most effective carrier of vibrations, like a crystal transmitter. It is this that allows mermaids, dolphins and whales to communicate with each other through thousands of miles of water in a very short amount of time. She reminds us to be cognizant of the sounds we make and the songs we sing, for this is one of the mermaids’ favorite things to do, She is a world-healing Goddess. The water goddess understands the power of the moon and how it controls the tides; sometimes the tide must go out before it can come in. She knows that everything moves in cycles so fear of losing it all is perfectly human but un-necessary – the natural primal state of nature is to flow so she teaches us to trust the process and let go of fear. What we do to water, we do to ourselves, what we do to the Earth Goddess, we do to ourselves.Humanity must come back to life seeing with wisdom eyes, hearing with listening ears, singing with new songs. Our bodies and our planet are over 75% water and we can honor the beauty and holiness, as water is a magical, blessed foundation for all life on Earth. We must once again learn to relate to it, to Earth, and to all life forms and elements, as Sacred.